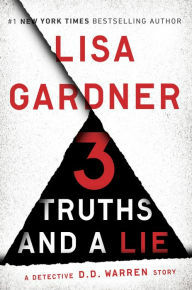 3 Truths and a Lie by Lisa Gardner is a very highly recommended short story featuring Detective D.D. Warren. There are also two chapters from Gardner's upcoming book, Find Her, being published on February 9, 2016. In this short story Detective D.D. Warren is facing a room full of mystery writers. She agreed to teach a fifty minute class at a Police Academy Writer's Conference on the realities of police work. Her husband, Alex, advises her that the group will like things bloody and gory. She decides that the class will be playing a game of three truths and a lie. The case she decides to share is one that features a seedy motel room, drugs, prostitution, and a severed leg. As Warren discloses the police procedures used to follow the clues to find out what really happened, she also asks the class of writers questions about the case and what steps they think the police should take next. This is a great short story and a good introduction to Gardner and her character, Detective D.D. Warren. While it is a short story, it will hold your attention, beginning to end, and the case is fascinating. It's also nice to have the preview of Gardner's upcoming novel. Disclosure: My Kindle edition was courtesy of the Penguin Publishing Group via Netgalley for review purposes.